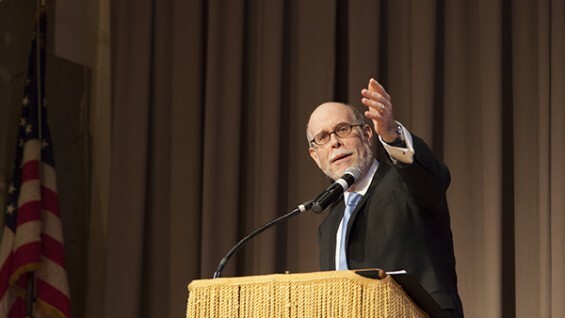 On the brisk evening of February 13, 2013, the day after President Abraham Lincoln's 204th birthday, hundreds of people filled the Great Hall for a timely, free event: The Civil War in Words and Music. Located in the same space where Lincoln made his famous "Right Makes Might" speech, the atmosphere brimmed with historical energy. Made possible with the support of The Iselin Fund for The Great Hall and the New York State Archives Partnership Trust, the show featured performances of period music by Judy Collins and Dar Williams, among others, along with a dramatic performance of an imaginary debate between Frederick Douglass and President Lincoln. Harold Holzer, author of the book Lincoln at Cooper Union, was the M.C. 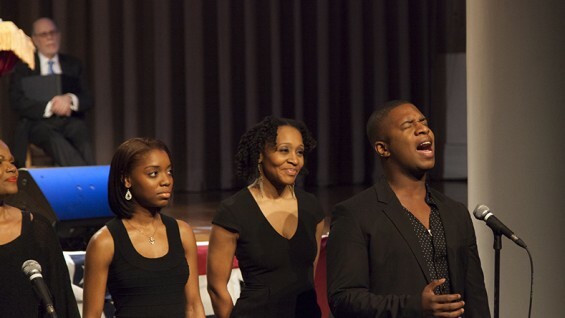 providing historical context for the musical and spoken vignettes reflecting on one of the defining cultural and political struggles of the United States of America—the abolition of slavery. 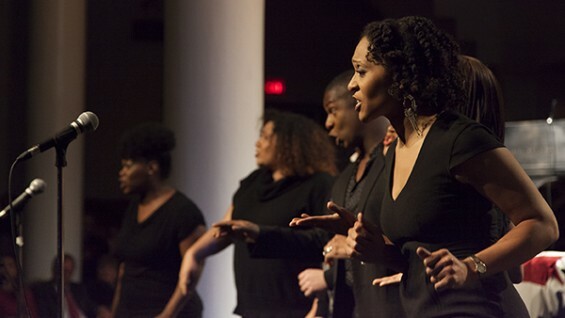 A choir from the Classical Theater of Harlem opened the evening with a rendition of moving spirituals from the time, including "Steal Away" and "Precious Lord." They immediately got the audience into the spirit with joyful clapping along in time. 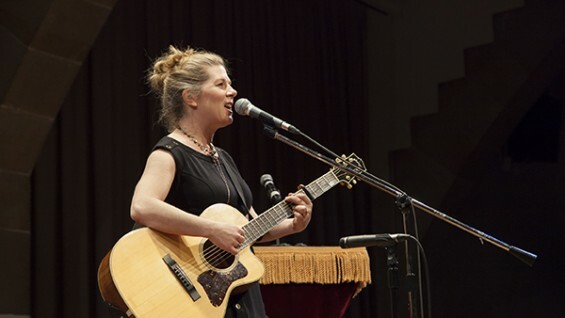 They were followed by Dar Williams—described by The New Yorker as, "one of America’s very best singer-songwriters"—who performed several historical songs of the civil war sung by soldiers of both sides including "Rally Round the Flag." Donning a simple black outfit, with blonde hair neatly held back and acoustic guitar slung over her shoulder, Williams managed to channel the historical material she sampled with humor and wit, interjecting her own observations in between songs. The emotional heart of the evening was a pairing of inspired performances by actors André De Shields and Stephen Lang (of Avatar fame). 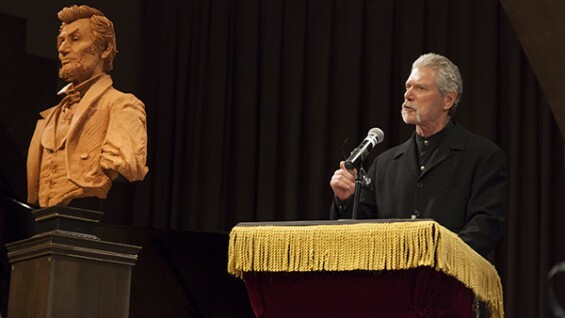 De Shields and Lang portrayed Frederick Douglass and Abraham Lincoln, respectively, in a collaged series of excerpts pulled from historical speeches, writing and correspondence by the two. Lincoln’s excerpts demonstrated his evolving position and thinking on slavery in America, while Douglass’ portrayed the abolitionist’s fearless challenging of the President to act more boldly and shepherd the irrefutable historical progress that abolition, and later civil rights, would bring. Grammy award winner and longtime folk chanteuse Judy Collins took the stage as the final act, performing Aaron Copeland’s Lincoln Portrait. While ordinarily performed with a full orchestra, the music had been transcribed for solo piano and voice, with Ms. Collins singing excerpts of Lincoln’s speeches and documents. These include the Gettysburg Address as well as the famed “Right Makes Might” speech delivered in the Great Hall. A standing ovation drew Collins back on stage twice to take a bow. As a finale everyone returned to the stage and sang "The Battle Hymn of the Republic." As audience members filtered out of the Hall for the evening many paused to examine the portraits of historical figures, including a bust of Lincoln in the Great Hall Gallery. Once such person was Keltha Mcaulay, who had come downtown from the Upper West Side to see the program. “A lot of the songs tonight reminded me of historical American songs my mother used to sing to me,” Ms. Mcaulay said, describing the magic that happens when personal family memories harmonize with deeper connections to American history as they did that evening.